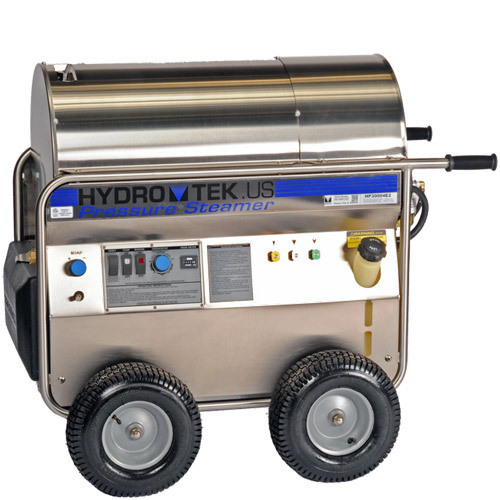 Hydro Tek HP Series Hot Water Pressure Washer comes with a high capacity burner and is portable. The HP Series hot water pressure washer delivers a balance of pressure, water flow and heat required for the fastest cleaning. A side-by-side demonstration will show that cleaning performance is determined more by the combination of water, heat and flow, not just pressure. The HP Series hot water pressure washer has the high capacity burner to accommodate high water flow and achieves a higher temperature rise than other washers and saves valuable time and effort. To save you even more time, it features auto on/off, remote downstream soap control and adjustable pressure, giving the operator control at the spray gun and saving pump components and wear. It even has full pressure steam setting to clean faster on heavy equipment, greasy floors, dirty walls, oily steel or any grime-ridden surface. With HP Series Hot Water Pressure Washers the operator has total control over the system from the trigger gun. This added convenience not only saves time and effort, it reduces wear and overheating of the pump and produces an energy efficient system that outperforms the traditional manual on/off. Front mounted controls allows quick and easy adjustments of temperature and steam settings with higher heat than comparable washers for your toughest cleaning applications.